A 7-step recipe for becoming a modern day black rapper. If you want to be a successful black rapper today, the rules of the game have changed a bit. There’s a new rap recipe — a formula to follow. If you manage to get a deal, your bosses will probably hip you to it. But if you’re so eager to become a modern day minstrel show… I mean black rap star that you want to learn the rap recipe now, print it out and be certain to follow it to the letter. We all know that rap isn’t so much about substance anymore as it is about a banging bass line. So save up your money and spend thousands on a producer to create beats that will completely drown out your lack of talent. The more banging the bass of the beat the better -- it’s guaranteed a hit even if as Jim Jones’ girlfriend Chrissy said “the only time you should be rapping is at Christmastime.” Use Souljah Boy, Gucci Mane, Kreayshawn, Plies, Young Joc and Birdman as a point of reference. To write a proper rap song you absolutely must include one simple-minded and pointless chorus. The chorus doesn’t even have to make sense or relate to the song’s theme - it just has to rhyme (somewhat). In fact the more ridiculous the chorus the better. For an example see Gucci Mane (Mouth Full of Gold, Pancake and pretty much everything else he’s released). As black rapper Jay-Z explained to Oprah, rap music is just an expression of your experiences whether they be real or imagined. So be sure to play into the stereotype of black men as drug dealing criminals, murderers and animals to create a perfectly crafted modern-day rap song. Talk about how many 8-balls and bricks you’ve accumulated. Then later you can complain about how the hip hop cops and “the man” is always trying to “keep a brother down.” If you’re a female rapper, do everything possible to live up to every negative stereotype that men have about women (i.e. gold diggers, sexpots and desperate for attention). Review Nicki Minaj and Trina’s work for an example of the latter case. Go out of your way to compliment light-skinned or white women. After all, why would you want to celebrate blackness under any circumstances as a black rapper? It doesn’t matter if you’re dark as midnight yourself and have a brown-skinned daughter or dark skinned family members. Show the world over just how much you hate your own dark brown or black skin and roots by praising its exact opposite in every song that you can. Create a list of everything that rhymes with yellow (mellow, hello, cello, pelo) so that you can fit the reference in smoothly as if it’s normal. Also, let the world know how much you hold white girls and white people in general in high esteem by talking them up for at least four bars in each song. If you want to be really clever, disguise your praise of whites by pretending as if you’re really just talking about drugs. For primary examples, pull up all of Lil Wayne’s songs (Every Girl, Right Above It, Hustle Hard), Chris Brown’s part in “Look at Me Now,” Rick Ross (BMF and White Girl), Trina (White Girls) and Young Jeezy (Put On). You know what makes a modern rap song just precious? A cute lil’ giggle. Make it your trademark. Practice giggling like a silly schoolgirl in the mirror before you go into the booth to get it just right. If you’re not one to giggle like a girl and really want to prove your manhood, grunt as if you’re taking a crap on the floor of the studio. See all of Rick Ross, Jay Z and Lil Wayne’s songs for examples. What would rap be if it weren’t for the N-word and the B-word? After all these words are “empowering”… and using it in everyday conversation makes you sound so cultured and intelligent. Yup. As a black rapper, it is also your responsibility to give young white American kids, like the new white “rapper” Kreayshawn, more confidence in using the N-word with each other and eventually with blacks. Imagine how "empowering" it would be to see a young white girl from Kentucky get comfortable enough to call your black momma the N-word! A minimum of 20-30 percent of your rap song must be composed of some combination of the words “n*gga,” “b*tch” or “ho.” It’s a plus if it rhymes, so start brainstorming. No modern day rap song is quite complete without a heaping helping of negative remarks about women in general and black women in particular. Avoid calling women of all colors by their given names or “lady” and only reference them by “b*tch,” ho, “skeeze” or “twist.” Go out of your way to insult and assault the women of your own race who share a common background and similar struggles. Who cares if they were riding with you when you were poor and broke down? Reward them with disrespect, they should have known you better! If you really want to hit home and put your inner self-hatred on full display call your fan base "nappy headed hos" and laugh at them. For a recent example see Nicki Minaj (Did It On ‘Em). * If you took any of this seriously, you're part of the problem, not the solution. Put down the mic and pick up a book. 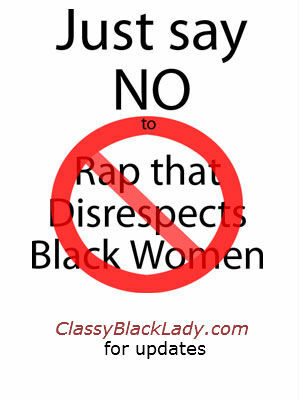 If you have a relevant article or story you wish to share regarding this issue or just want to show your support for the "Just Say No to Rap that Disrespects Black Women" movement, email us here. hey elegance... I tried salsa and couldn't quite keep up! lol but now I mostly listen to high energy dance music. If I do listen to rap it is lupe fiasco because he talks about politics and positivity. thanks for your post! what if i rap about what I read? I stumbled here looking for lyrical patterns. At first, I was pretty frustrated with what I read until I got to the end. Thank you. I was so disappointed at this all the way up until the ending. Way to go out with a bang. It's crazy how mad I was and now the same material has me laughing.